Ace Attorney: Duel Destinies may take the franchise in a darker direction, if the ESRB's verdict is anything to go by. 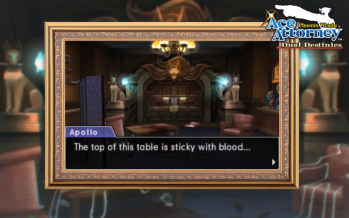 Phoenix Wright: Ace Attorney and its sequels walk a strange line between the merry and the macabre. The plot of each game typically involves a series of investigations into grisly murders, but everything is pretty kid-friendly. So far the series has received a T rating from the Entertainment Software Ratings Board in each of its incarnations - until now. Phoenix Wright: Ace Attorney - Dual Destinies, in addition to being a mouthful of a title, has been rated M for "Mature." It's a first for the series, and since we've heard no objections from Capcom, it looks like the latest game will take Ace Attorney to new levels of "serious business." Having reviewed Dual Destinies, the ESRB offers warnings of "Violence, Blood, Suggestive Themes, and Language" - which are actually the very same content descriptors assigned to the first game in the series back in 2001. So even if Capcom isn't exploring new and exciting avenues like intense gore, the typical elements have been pushed far enough that the American and Canadian rating system doesn't recommend the game for players under the age of 17. The content we have seen from Dual Destinies still looks like it has all the eccentric charm the series is known for, so it's probably safe to assume that we aren't looking at L.A. Noire levels of morbidity. It's still unknown what exactly warranted the increased rating, but if anything comes up in the investigation, we'll let you know.